Get up to £150 cashback on selected Nilﬁsk hot water and cold water pressure washers by collecting a voucher from the LAMMA Show. Speak to a member of the Nilfisk team at stand 910 in Hall 9 to recieve your cashback voucher and get up to £150 cashback from Nilfisk authorised distributors. How do I claim my cashback voucher? ​Cashback claims must be received by 31st January 2018, please click 'learn more' below for more detailed terms & conditions. Get up to £150 cashback on selected Nilﬁsk hot water and cold water pressure washers. Nilfisk pressure washers are powerful, robust and offer optimal cleaning efficiency; just what you need to get the job done. 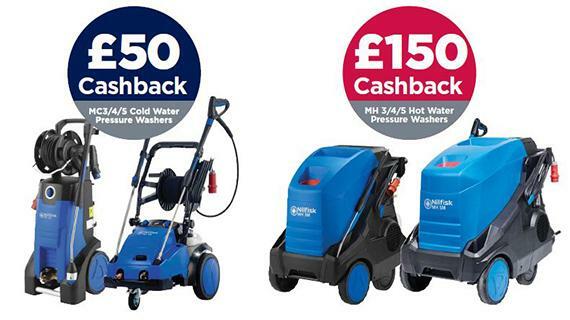 The Cashback offer means there has never been a better time to buy a Nilfisk Pressure Washer. You can find Nilfisk at stand 910 in Hall 9 at the LAMMA Show. We have a number of dealers nationwide who are offering £150 cashback on selected hot water pressure washers and £50 on selected cold water pressure washers. To claim your cash back on qualifying machines you must purchase your Nilfisk Pressure Washer from participating Nilfisk distributors. How do I make a cashback claim? 1. Simply collect a cashback voucher from the Nilfisk stand, 910, in Hall 9 at the LAMMA Show. 2. Purchase a qualifying machine from a Nilfisk dealer. 3. Post your cashback voucher and proof of purchase to Nilfisk Ltd, Nilfisk House, Bowerbank Way, Gilwilly Industrial Estate, Penrith, Cumbria, CA11 9BQ by Wednesday 31st January 2018. Nilfisk Ltd reserves the right to alter, cancel or withdraw this promotion at any time without prior notice. This cannot be used in conjunction with any other offers. T&Cs apply. £50 cashback is available on MC 3/4/5 cold water pressure washer models. £150 is available on MH 3/4/5 hot water pressure washer models. Offer only applies to LAMMA show attendees. Limited cashback available. Post your cashback voucher and proof of purchase to Nilfisk Ltd, Nilfisk House, Bowerbank Way, Gilwilly Industrial Estate, Penrith, Cumbria, CA11 9BQ by Wednesday 31st January 2018. Please allow up to 60 days from submission of completed claim for delivery of cashback cheque. Claims will only be considered completed once a completed form and valid receipt has been received via this online form. Qualifying cashback amountwill be sent by post as a cheque to address specified. Cheques may only be made payable to the company name/ individual shown on the proof of purchase not any other nominated individual. Offer available to companies or individuals based in the UK only.